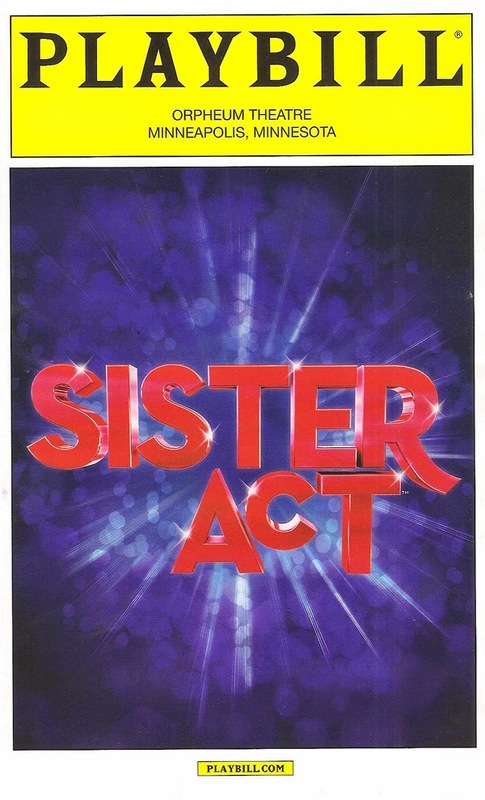 The 1992 Whoopi Goldberg hit comedy movie Sister Act was recently turned into a musical, because that's how most Broadway musicals are made these days. And while I'll always be an advocate for new original musical theater, this is one of the few movie-musical adaptations that actually makes sense because music is central to the original movie; it's about the power of music to bring people together. I saw the First National Tour of Sister Act last night on the first night of its week-long stay in Minneapolis, and I had a great time. It's nothing deep or ground-breaking, but it's funny, heart-warming, and features some great new music (by Alan Menken) with a smooth '70s groove. Sister Act is one of those shows you go to for the fun of it, like a summer blockbuster. If you're unfamiliar with the movie, here's the general gist of it: in 1978 Philadelphia, aspiring singer Deloris sees her bad guy boyfriend kill someone, so the police send her into hiding in a convent. Needless to say, the Mother Superior does not approve of Deloris, who has trouble giving up her worldly ways to live the life of a nun. But she recognizes Deloris' skill in music and puts her to work with the abysmal choir. 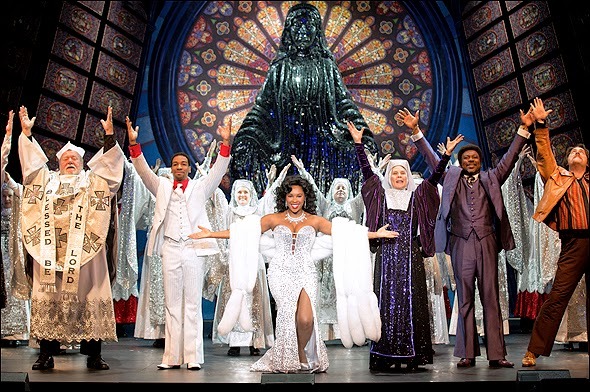 Under the direction of Deloris, aka Sister Mary Clarence, the sisters become a fantastic musical act which brings more people into the church and saves it from being sold. Unfortunately it also brings attention to Deloris and allows the bad guys to find her, but Deloris refuses to abandon her sisters before their papal performance. Will Deloris be saved from the crooks, and will the sisters pull off their biggest show yet? It's a musical - what do you think? As Deloris, Ta'rea Campbell is, as her character sings, "Fabulous, Baby!" She and Hollis Resnik as the Mother Superior made a dynamic comedy duo. All of the women playing the wise-cracking nuns are great too, especially Florrie Bagel as the perpetually happy Mary Patrick and Ashley Moniz as the young postulate who find her voice. The bad guys are super '70s cool, including Melvin Abston as Deloris' velvet-voiced boyfriend and Charles Barksdale as his dimwitted nephew TJ. The guys' Temptations-like numbers, singing about killing Deloris ("When I Find My Baby") and seducing nuns ("Lady in the Long Black Dress"), are a highlight, with groovy choreography by Anthony Van Laast. Special mention goes to Chester Gregory as Deloris' high school friend "Sweaty Eddie" who's now a timid cop. He exhibits remarkable vocal control in his big number "I Could Be That Guy," transforming from Steve-Urkel-awkward to John-Travolta-in-Saturday-Night-Fever-cool with the vocal stylings that go along with it. Other musical highlights include "Take Me to Heaven," Deloris' Motown song about a woman singing to her man that becomes the nuns singing gleefully about their God, and "Raise Your Voice," when the sisters find their individual voices and sing gloriously together. The costumes (by Lez Brotherston) are pretty fantastic too, from sequined habits to halter tops to bell-bottoms. I'm always amazed when the most elaborate costumes only come out for the curtain call; it seems like such a waste that they're only seen for a few minutes, but it's worth the pay-off. As a person who was raised Catholic and went to Catholic grade school, I enjoy a little Catholic humor. But I don't think it's disrespectful. Similar to The Book of Mormon or Altar Boyz, the fantastic musical about a Catholic boy band, they make fun of some of the rituals and habits (no pun intended) while still being respectful of the faith behind it. I like that the driving story is not a romance, but a sisterhood. Maybe it's a little hokey, but it's a lovely message about friendship, togetherness, and helping our fellow humans. And as Deloris and the Mother Superior debate, whether that's God or just being human or both, it's a hopeful message. The sisters are celebrating at the Orpheum Theatre in Minneapolis through Sunday June 1, click here to join the joyous celebration. Thank you for this article and the infos you provide. I saw Sister Act in Germany and have to say, i listened to very good music, a well known fantastic story and all had that kind of humour i like. You will notice, that Whoopie Goldberg was involved when creating the musical (co-producer for the german musical too). So nearly 3 hours of fun and good music lets you go home from Sister Act with a deep feeling of easy living.